Could the GOP take out New Jersey Sen. Bob Menendez? U.S. Sen. Bob Menendez on Monday. It turns out that an 11-week bribery trial and a steady stream of news about free trips to Paris and the Dominican Republic aren't great for a U.S. senator up for reelection. But the question for Sen. Bob Menendez is whether his underwhelming primary victory Tuesday over a little-known challenger is just a sign of discomfort among the Democratic base or a harbinger of real trouble to come in his campaign against Republican pharmaceutical executive Bob Hugin. 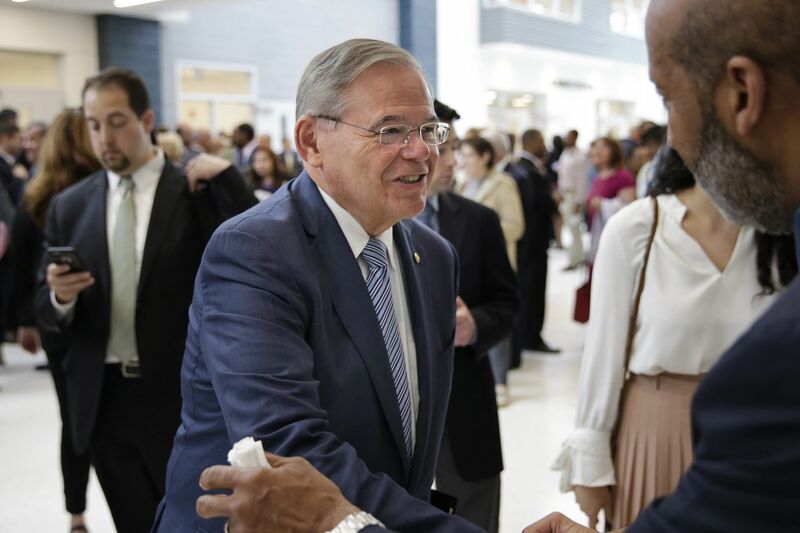 Democrats believe that despite some voters' misgivings about Menendez, their revulsion for President Trump will save the Democratic incumbent in November. There are 900,000 more registered Democrats in the state than Republicans — about a 65-35 advantage — and the Garden State hasn't elected a Republican to the Senate in nearly a half-century. At a minimum, though, Menendez's potential vulnerability may create headaches for national Democrats, who are working to protect incumbents in 10 states Trump won in 2016. In addition to playing defense, Democrats need a net gain of two seats to take control of the Senate. Hugin has invested $7.5 million in his campaign and is expected to commit more. Tuesday's results portend "some difficult times for Sen. Menendez. I still think it's likely he'll pull it off, given the fact we're in a Democratic state," said Krista Jenkins, director of Fairleigh Dickinson University's Public Mind poll. But, she said, the race won't be the "cakewalk it usually is" for incumbent New Jersey senators seeking reelection. A May 25 Fairleigh Dickinson poll found that Menendez had a slight edge over Hugin but that 46 percent of voters were undecided. Thirty-nine percent of registered voters said they viewed Menendez unfavorably, while just 32 percent had a favorable opinion. Hugin was relatively unknown. Bob Hugin, a Republican running for U.S. Senate, gestures while exiting his polling place after casting his vote in the New Jersey primary election Tuesday. Menendez, who's running for a third six-year term, defeated Lisa McCormick, a weekly newspaper publisher, with 62 percent of the vote. Menendez had raised $8 million and had the full support of his party's leadership, while McCormick didn't report raising any money. By comparison, incumbent U.S. Sen. Frank Lautenberg won 59 percent of the vote in the 2008 Democratic primary against Rob Andrews, a sitting congressman who had won several endorsements from county parties. Cory Booker won 61 percent of the vote in a 2013 special U.S. Senate primary election against two congressmen and a state lawmaker. "To put it mildly, he underperformed," said Bob Shrum, a retired Democratic consultant who worked on Jon S. Corzine's successful 2000 U.S. Senate campaign. "It was a protest vote." Menendez, 64, has faced scrutiny since federal agents raided his friend Salomon Melgen's South Florida offices in 2013. The men were indicted in 2015 on bribery charges. Prosecutors accused the senator of accepting free vacations, hundreds of thousands of dollars in campaign contributions, and other gifts in exchange for advancing Melgen's personal and financial interests. Their trial ended in a hung jury in November and a federal judge subsequently acquitted Menendez of some of the charges. Prosecutors then dropped the case. In April the bipartisan Senate Ethics Committee reprimanded Menendez with a letter of severe admonishment, a rare punishment. The race is shaping up as an ugly campaign to determine which candidate is the bigger crook. Hugin, a Marine Corps veteran who retired in January as executive chairman of Summit, N.J.-based Celgene Corp., has been running ads reminding voters of the bribery allegations. "It's a disgrace," the narrator says in one ad. "New Jersey deserves better than Bob Menendez." Hugin, 63, has presented himself as an independent thinker who favors abortion rights and wants to "fix our immigration system in a comprehensive and compassionate way." "He wants to go to Washington and represent New Jersey first," Hugin adviser Chris Russell said Wednesday. Hugin has his own political baggage. Celgene last year agreed to pay $280 million to the federal government and more than two dozen states to settle claims that it marketed cancer drugs for off-label uses. And Hugin contributed more than $100,000 to Trump-affiliated committees in 2016. That could hurt him in a state where 61 percent of residents disapprove of the president's job performance, according to an April Monmouth University poll. Menendez said late Tuesday that Hugin "is going to have to answer for his record of driving up prices for cancer patients while making millions for himself." The senator added in a statement that Hugin would have to "defend helping elect Donald Trump." Shrum, the former Corzine adviser, said some Democrats "may be disenchanted with Menendez, but they despise Trump." "Trump will be the great Democratic vote organizer in November," said Shrum, now a professor at the University of Southern California. Republican Newt Gingrich, the former House speaker, had a different take. Noting Menendez's rough night Tuesday, Gingrich wrote on Twitter: "The red wave is building in the Senate."